Christian McCaffrey (RB-Car) was the 2nd pick of our 2017 fantasy football dynasty league rookie mock draft. Let's review the Fantasy News Hour's 2017 fantasy football dynasty league rookie mock draft. Listen to the 2017 dynasty league rookie draft podcast. The draft was a 12-team, 2-round, dynasty league, rookie draft. The draft was a non-snake draft - meaning the team with the 1st pick also had the 13th, and so on. There were four drafters, each drafting three teams. Peter M. Lopez (1, 5 & 9), co-host of the Fantasy News Hour, fantasy football legend (in my mind, at least), and FNH circus master. Brandon McAuliffe (2, 6 & 10), Abilene Reporter-News sports reporter, quite possibly the worst fantasy football player in history, and FNH regular guest. TJ Wilson (4, 8 & 12), co-host of the Fantasy News Hour, draft junkie, and FNH's resident stat nerd and sabermetrician. 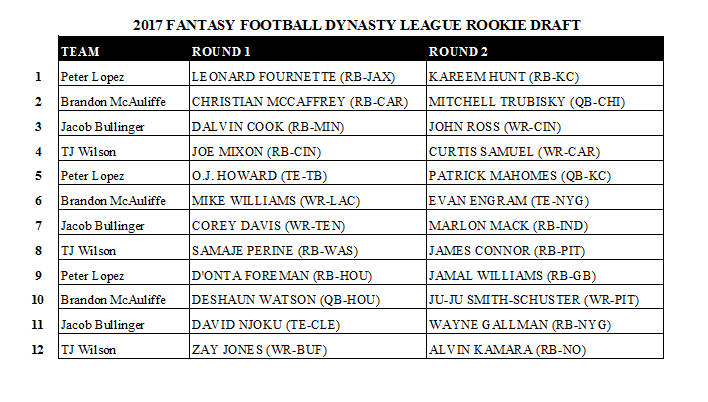 Leonard Fournette (RB-Jax) was the first pick of the Fantasy News Hour 2017 dynasty league rookie mock draft. Most notable and most obvious was the run on running backs with the first four picks. It's not a huge surprise that Leonard Fournette (RB-Jax) and Christian McCaffrey (RB-Car) went one and two, but everyone must have wanted to secure a running back because Dalvin Cook (RB-Min) and Joe Mixon (RB-Cin) went three and four. Mixon could be a steal at four. Actually, I was hoping Mixon would fall to me at five, but he did not. My bias toward tight ends led me to take O.J. Howard (TE-TB) fifth. Admittedly, it was a bit of a reach, but Howard could be a top-tier tight end for years to come. It's somewhat surprising that Corey Davis (WR-Ten) fell to seventh, after Mike Williams (WR-LAC) was drafted sixth. As of this writing, ESPN's Mike Clay and Pro Football Focus both have Davis as the No. 1 rated rookie for 2017, so a fall to seventh is unlikely in most drafts, but it did happen here. Another mini-run on running backs followed with Samaje Perine (RB-Was) and D'Onta Foreman (RB-Hou) going eight and nine. I agree, I reached for Foreman, but I'm a Longhorns fan, and I'm not sold on Lamar Miller (RB-Hou). And, just like Mixon, Perine could be a Sooner steal at eight. Deshaun Watson (QB-Hou) at ten is a little early for me; but if you are drafting in Texas, there's bound to be a Texans fan or two in your league. Watson probably does have the most immediate fantasy impact for a rookie quarterback, and he has excellent weapons. David Njoku (TE-Cle) and Zay Jones (WR-Buf) rounded out the top twelve, and both have big question marks at quarterback. Their talent isn't a question, but their opportunity is. Patrick Mahomes (QB-KC) was the 4th pick of the second round in our rookie dynasty league draft. I was thrilled Kareem Hunt (RB-KC) fell to me with the first pick of round two, 13 overall. Jamaal Charles (RB-Den) is sporting new duds in Denver, and the Chiefs don't seem to be sold on Spencer Ware (RB-KC). Mitch Trubisky (QB-Chi) was the No. 2 overall pick of the 2017 NFL Draft, but only the No. 2 pick of the second round in our rookie draft. Someone is wrong, either the Chicago Bears or the four of us. Trubisky could be a fine NFL quarterback, but he's not a fantasy option in 2017 or anytime soon. John Ross (WR-Cin) and Curtis Samuel (WR-Car) went next. Both are talented wide receivers in good offenses, but both have excellent WR1's in front of them. My own personal favorite pick was Patrick Mahomes (QB-KC) in round two. It's a long-term dynasty league stash, I do realize, but Mahomes is a gamble worth taking. He's got the best arm talent of any quarterback in the draft, and Andy Reid is a QB-wizard. In two to three years, Mahomes will be the man in KC and on your fantasy team. Evan Engram (TE-NYG) fell surprisingly far to 18 overall. I think this speaks more to the depth of running backs than Engram himself, though. Speaking of running backs...there was another run at 19, 20, 21, 23 and 24. Wow! It feels like the good old days with so many running backs going here. Marlon Mack (RB-Ind), James Connor (RB-Pit), Jamal Williams (RB-GB), Wayne Gallman (RB-NYG) and Alvin Kamara (RB-NO) all could surprise us and be top-12 running backs this season. I don't know that I would bet on any one of them being that, but I'd take the field and bet that one of them is. Only Ju-Ju Smith-Schuster (WR-Pit) - the funnest name in football - broke the sting of five consecutive running backs. DeShone Kizer (QB-Cle) was among the undrafted in our 2017 fantasy football rookie draft, but could surprise in a year or two. Notable absences were receivers Carlos Henderson (WR-Den), Taywan Taylor (WR-Ten), ArDarius Stewart (WR-NYJ), Cooper Kupp (WR-LAR), and Josh Reynolds (WR-TB). Most of them went to crowded receiving corps, and Stewart and Kupp went to the Jets and Rams. Undrafted backs were Donnel Pumphrey (RB-Phi), Aaron Jones (RB-GB), and Jeremy McNichols (RB-TB). Again, crowded backfields. Deshone Kizer (QB-Cle) is the only quarterback of note to go undrafted. The Browns roster, however, is looking better and better. Kizer could surprise some folks in a year or two. 12, or one-half of all picks were running backs. I don't know if that speaks to the depth of RB in this class, or the lack of good ones in the NFL. Probably both. Copyright 2015-2017 Peter M. Lopez and TJ Wilson, all rights reserved.